We recently bought a house in Roseville ca and Mimi Nassif helped us find the right house for the right price in the desired neighborhood.she always responds immediately to phone calls ,texts or emails. She is very knowledgeable about the neighborhood, schools, activities, attractions near by and safety. 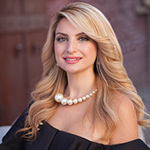 Mimi Nassif is sincere, reliable and honest regarding every detail in the houses she showed us.she never pressurized us to put an offer on any of the houses and she left that choice completely to us. She’s also very aware of the fair market price and really good in negotiations.she worked with us during the entire process starting from finding right home, getting the right inspectors, getting the repair done in house after inspection, helping me understand about the real estate process, and doing whatever is needed. She introduced us to good mortgage lenders and we were able to get mortgage with low interest rate too. We recently recommended her to our friends and she helped them too. Thank you Mimi Nassif for working with us.